This is the last one of these for a while probably. Mad River Glen kind of takes Smuggler’s Notch’s approach of “mostly locals” and pushes it a little further into something akin to “locals only”. It’s a little odd showing up at a ski resort where everyone else seems to know each other because they’re all part of the collective and you’re not. I spent most of the day feeling like I was doing it wrong. Whatever it was. They only have four lifts, two of which seem mostly superfluous. The lift going up the big mountain is a single chair (see first photo above). They take significant pride in that anachronism. The resort also keeps the mountain “natural”, which was interesting. Good-interesting. Very little grooming or snow-making, the runs seem to fit the mountain (whatever the means), a couple of creeks running down the hill, and a waterfall adjoining one of the routes down. The natural situation also results in some more challenging terrain than you usually see. A lot of black diamonds, none of which get cat-tracked. At least a couple of the green circle trails had significant mogul fields on them. All-in-all, it’s a compelling place. Not a lot of people and a very different attitude. I got the impression that the customers there sometimes take turns running the lifts. (It is, seriously, owned and operated by a collective.) I’d like to go back some time if only to see what it’s like when the conditions are better (the night before it had rained for several hours, then froze, then early in the morning it got a couple inches of new snow, then it warmed up into the 30s during the day resulting in a rough mixture of ice and slush with occasional puddles). There was a lot of good-looking terrain here that just needed some snow. And I only paid $30 for the lift ticket (via Liftopia). So there was that. My hotel was located about six miles away from the Smuggler’s Notch ski resort going by way of Highway 108. 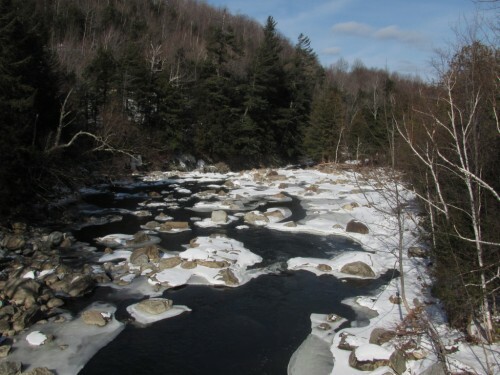 The state of Vermont closes Highway 108 between Stowe and Smuggler’s Notch during winter. Ergo, it took me about an hour to get there via the great circle route. Not a bad drive, just a little silly. From the top of Smuggler’s Notch you can see Mt. Mansfield and some of the runs at the Stowe resort 4 miles or 70 minutes away. On the other hand, at least it’s not a single-chair, right? ‘Cuz nowhere would have one of those any more. The day I was there was warm (50+ degrees) and sunny. Snow conditions ranged from spotty to slushy, though it should be noted that in the continuum that exists in my mind there’s some decent snow between spotty and slushy. Maybe just not a lot of it. A guy who sold his landscaping business in Massachusetts to move to Vermont and now works for the parks department somewhere. A guy who told his boss, who’s from Tennessee, that he shouldn’t bother trying to keep his car clean in the winter and that he better get used to employees coming in late whenever there’s a decent overnight snowfall. A woman whose best friend lives in Pittsburgh and who regrets the fact that USAir no longer flies non-stop from BTV to PIT. A French-Canadian teenager who has been to more major league ballparks than I have and who takes joy in hating on the Canadiens. A guy whose daughter is big into whitewater kayaking and is taking a month-long trip down the Colorado River this month. A guy who denigrates Jay Peak (another ski resort) because it’s too close to Canada and, thus, draws too many Canadians (he refers to it as “Eh Peak”). I’m still not sure as to what the appropriate number of Canadians at a ski resort would be. It was a fun day. Tried skiing in the glades a little bit, which was kind of different. A few of the decent slopes had enough snow on them to go down. The atmosphere was as laid back as I’ve experienced at a ski resort. Cool place I’d be happy to check out again some time. Skiing Stowe was expensive and nice. Great weather, they take care of the mountain well, tons of parking right next to the lifts (!! ), lifts go to useful places, many (long) runs of varying description, etc. Locals seem to dislike it because it doesn’t offer them any in-state discounts. Fair enough, but the discounts for out-of-staters aren’t great either, but I got over it. Top of Mt. Mansfield (Vermont’s highest point!) from the top of the Stowe quad. Looking up the gondola lift-line. Chute full of moguls somewhere at the bottom of the hill. I think this run (“Hayride”?) is less flat than it looks. View across the top of the ski hill from the quad to the gondola. So that’s what it looks like. Sunny weather and the snow was surprisingly good everywhere. What else? I think the locals also don’t like it because Stowe doesn’t let skiers ski in the woods. That’s usually sort of a thing in the northeast. Stowe moves a lot of people up the hill, but the slopes never seem crowded and there were never any serious lines. The place feels smaller than it is. IMHO. In a good way. A lot of French-speaking Canadians. Again. The resort has two different sides to it with a gondola connecting the two sides (by crossing the parking lot and the highway). The other side is kind of lame though. Although it seemed odd to me that the lame side is the one with all the condos and shops. The lodges on the non-lame side seem a little more rustic than you’d expect at a ski resort that charges $92 a day. Skiing on the quad is more challenging/interesting than skiing on the gondola. The bacon cheeseburger in the cafeteria was overpriced. That probably would’ve gone without saying. At the top of the gondola they have a waffle stand, but I did not buy a waffle. Had a great day here. Would gladly return. $92 (or $78 pre-purchase through Liftopia) is steep, but if you’re going to drive 12 hours to go skiing, I mean, you know. May as well. First night of the trip I stayed in Saranac Lake in the Adirondacks in New York. Thought the place was cool when I was there in the fall of ’09 on my road trip (e.g., this 48stateroadtrip post), so was stoked to be back up there. Took about nine hours from my house in Pittsburgh to the Best Western in Saranac Lake. One of the best things about that part of the country is its complete lack of pretension. Saranac Lake is a lake-based tourist town, but it doesn’t come off acting like it. Which I appreciate. For whatever reason. Which were pretty awesome. All we get in Pittsburgh are straight, boring ones. I suppose it’s a good thing it was icy, otherwise I’d feel like I hadn’t had the true Whiteface Mountain experience. “Iceface” being the nickname. It rhymes (sort of) and, therefore, is true. Also it’s icy there. New York, Adirondacks. Near Lake Placid. It’s where they did all the skiing events for the 1980 Olympics. Steep, stupid pretty, stunningly cold, and firm. Whiteface summit. The olympic downhill course started here. I tried it. It was steep. And icy. Heading up-lift toward the summit. Whiteface summit (highest point in New York!) taken from the top of the gondola. Lake Placid taken from the top of the summit lift. Inside the Gondola with French-speaking Canadians. The French-Canadians seem to need to talk (to each other) a lot. Au Sable River at the bottom of Whiteface Mountain. You cross this to get from the parking lot to the lodge. -2 at the bottom, -12 at the top. Degrees Fahrenheit. Firm at the beginning of the day, firm at the end of the day. Just about had frostbite from driving there. Switched hands on the steering wheel every 30 seconds so I could keep the other one inside my coat. Apparently it takes more than half an hour for my car’s heater to start working. I had never skied from a gondola before. It’s warmer than the normal chair lift. The cafeteria chili wasn’t very good. I got my lift ticket for $25.75 off of Liftopia. Regular price is $79. BKD ftw. For once. I caught an edge on the downhill course and ended up sliding on my belly for about half a mile. It was steep. And slick. I imagine a little snow and about 15 degrees warmer would make this place great. If only.